I got over 87 miles per gallon during a week of driving my last test car. And it wasn't a tiny two-seater with a spartan interior and an underpowered engine. It was a stylish midsize sedan with luxury features and plenty of power. 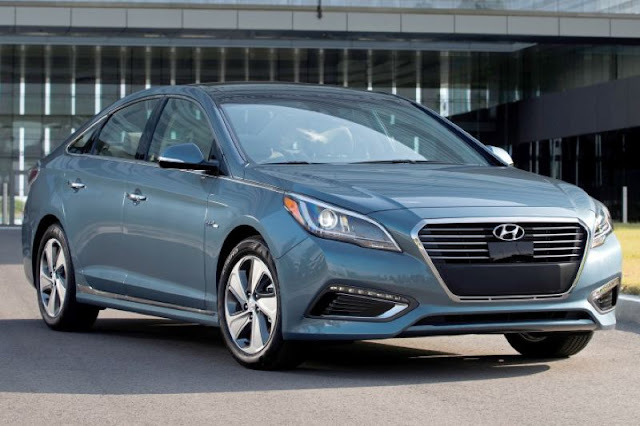 The car was a 2016 Hyundai Sonata Plug-in Hybrid. As the name says, it's the plug-in version of the Sonata Hybrid. That means it is a conventional gas-electric hybrid with additional battery capacity that can be recharged from an electric outlet. With the battery fully charged, I could drive the Sonata about 25 miles on electricity alone. After that, it switched over to a conventional hybrid mode, where the gas engine and electric motor shared duties and returned around 40 miles per gallon. Although 25 miles might not sound like much, it was just about enough for my daily commute and normal weekend driving. And by always recharging the battery when I was at home, most of my total driving was on electricity alone, which explains the high mileage. And I could press a button so the engine recharged the additional battery capacity as I drove along. I'm sure that took at least a little gas, however, and I couldn't figure out if it was worth it, especially since, like all conventional hybrids, the Sonata recharged the battery during braking. And when it did switch between electric and conventional hybrid power, I didn't even notice. There was not as much as a vibration to tell me it had happened. The only sign, other than the EV light going out on the dash, was a subtle exhaust note suddenly audible under moderate acceleration. My schedule did not allow me to take any long trips, but if I did, it probably would not have dropped much below 60 miles per gallon — a remarkable accomplishment for any car, let alone one as large, comfortable and powerful as the Sonata. With a combine total of 202 horsepower on tap, it was fast on level roads and never bogged down going up hills. The Sonata has long been one of Hyundai's best selling models for several reasons. It is larger than many other midsize sedans, can be outfitted with luxury options, is very quiet on the road, and practically floats over potholes. The current version was completely redesigned two years ago to offer more interior room and high quality interior materials. Although the styling was toned down from the swoopy exterior lines that generated so much attention, it is still a good looking car that should age well over the years. The current Sonanta is available with a number of powertrains, including a normally aspirated 2.4-liter 4, an economical turbocharged 1.6-liter 4, a powerful turbocharged 2.0-liter 4, and a conventional gas-electric hybrid. Of those, the Hybrid offers the best mileage with an EPA estimate of around 42 average. But for those most concerned about the environment, the Plug-in Hybrid easily beats it without sacrificing any of the qualities that make the Sonata such a great car, except for a little trunk space for the additional battery capacity. The only problem with hybrids is they cost more than gas-powered cars, and plug-in hybrids cost more than conventional hybrids. But at $39,610, our well-equipment Limited version did not seem overpriced, considering it came with practically every available options, from heated and cooled leather seats to an upgraded infotainment system with connectivity and a wide array of safety system. And for those worried about the hybrid battery wearing down, it has a lifetime warranty. Auto writers have been wondering how manufacturers are going to meet the federal government's increasing fuel economy standards. The 2016 Hyundai Sonata Plug-in Hybrid is a good example — it is a car designed for the masses that just happens to get extraordinary mileage.